The Danish furniture and interior designer Finn Juhl, with Klaare Klint and Arne Jacobson, made Denmark a leader in modern home furnishings in the 1940s and 1950s. Juhl, in particular, led the fashion for Danish modern domestic furniture in the American market during the 1950s and 1960s. Juhl trained in architecture at the Academy of Arts in Copenhagen. He graduated in 1934 and spent the first 10 years of his career working in the architecture offices of Vihelm Lauritzsen in Copenhagen. He made his debut as a furniture designer at the Copenhagen Cabinetmakers’ Guild exhibition at the Museum of Decorative Arts in 1937. 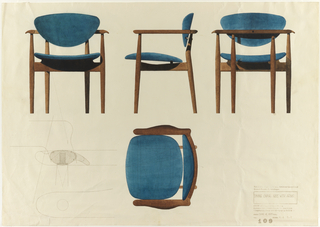 Considered highly controversial in the 1930s and 1940s, Juhl’s furniture broke with... more. We have 2 objects that Finn Juhl has been involved with. Phillips de Pury & Luxemburg.